College athletics is popular in the United States. According to a Statista survey more than 70 percent of survey respondents follow college basketball at least occasionally. Almost 31 million have attended a college sports event in 2017. The main governing body of college sports in the United States is the National Collegiate Athletic Association (NCAA). The NCAA is a nonprofit organization responsible for organizing the athletic programs of the majority of universities and colleges in the United States and Canada. 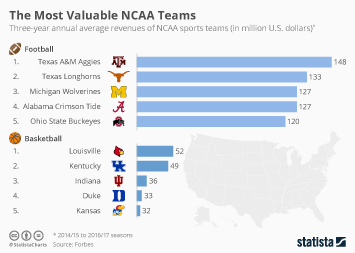 The NCAA generates most of its revenue from television and marketing rights fees. In its 2017 financial year the NCAA generated 820 million U.S. dollars in revenue from television and marketing rights fees. Men’s college basketball trails only football in popularity. According to Scarborough Research 23.62 million people in the U.S. are "very interested" in college basketball, 51.82 million have watched a college basketball game on broadcast TV at least once in spring 2017. The attention paid to the sport heightens each year with the start of the college basketball tournament – often referred to as March Madness. The championship game in 2017 for example had a TV viewership of 23 million. Almost half of the population in the United States is at least somewhat interested in college basketball according to a 2017 Statista survey. The same survey also revealed that about the same amount of people will watch at least some tournament games.